High School Sweethearts and now more. The story is like something out of a 90’s teen movie. The sweet shy girl meets the captain of the football team… And sparks fly! At least that is what I picture when I read their sweet story! These two are such a lovely couple. He is the one that can put her at ease and a place for her to find rest and comfort. She is the one that accepts him for who he is and loves and encourages him. The way they smile at one another and the glances they steal when they think no one is watching is just the beginning of their love story. I see them building such a great life together and always coming back to each other when things get hard. They just have that kind of love. We met them at the Noland Trail. This is such special spot for them. Not only do they walk the trails together, but this is where Matthew proposed. The colors of the trees were vibrant and the two of them looked so classy! I just love April’s dress!! It looked amazing on her! 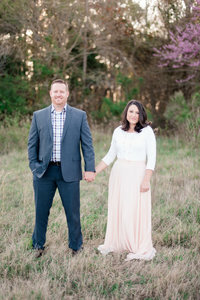 Thank-You April & Matthew for such a fun session! We are looking forward to seeing you guys next year! We seriously have some gorgeous sunsets!!! Such a cute couple. You got some amazing pictures!